Khann Sovan presides over the Pride blessing ceremony. At least two hundred people gathered at the Tuol Dombok Khpos pagoda in Phnom Penh last Sunday to bring the week-long Lesbian, Gay, Bisexual and Transgender (LGBT) Pride festivities to a close in a very Buddhist way. 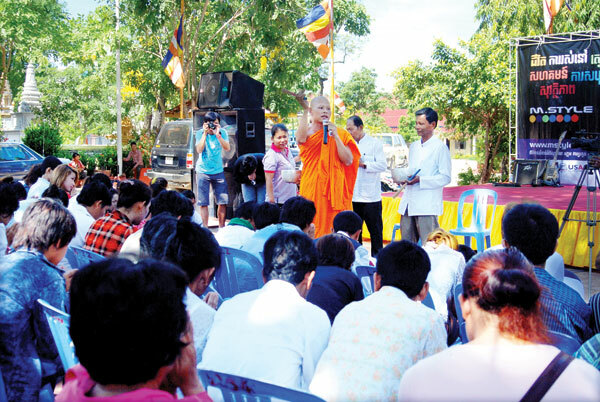 Khann Sovan, head of Tuol Dombok Khpos pagoda, presided over a traditional blessing ceremony where he said that Buddhism has never conflicted with issues of sexuality or gender identity. “Our Buddha taught us to love each other, to help each other and not to discriminate against each other,” Khann Sovan said. The monastic gave a speech about the five precepts of the Dharma, or the Buddha’s teachings: not to kill, not to consume intoxicants, not to lie, not to steal, and not partake is sexual misconduct. He then sprayed attendees with holy water. The morning blessing ceremony lasted about half an hour and was followed by a Community Day consisting of live entertainment and traditional games, as well as educational activities to raise awareness of HIV issues. Srun Srorn, the facilitator of Rainbow Community Kampuchea (RoCK), one of the main organisers of Pride, said that he wanted lesbian, gay, bisexual and transgender people to feel connected with their religion. Because members of the LGBT community may feel separated from their religion, he said he hoped the ceremony would bring them closer to the humanitarian principles of Buddhism. At the same time, he also wanted to give a message to Cambodian people whose mind cannot accept homosexuality, or those who think that it is unnatural. “I believe that nobody made us as homosexual or lesbian person. It came from our birth. So old people have to understand this and stop banning the homosexual or lesbian behaviour of their children any more.” he said. This year’s Cambodia LGBT Pride launched on May 12 with a variety of activities such as art shows, film screenings, live performances, and workshops about gay rights. Unlike Pride festivities in other parts of the world where revellers parade through public thoroughfares, though, Cambodia Pride was organised as a series of smaller affairs. Srun Srorn said he felt Cambodian society was open to the LGBT community because none of the festivities were interrupted by the police. “If we organised a huge crowd, we would be split up by police ... We understood that issue in advance, so we organised smaller events but at many different places,” he said.